Of all the terrible fates to befall an ordinary person, mine was the worst. It ruined my life. Like millions before me, I immigrated to the United States of America to seek a better life. Instead, for 26 years, I lived on an isolated island, shunned by the world. My plight begins shortly after my arrival in New York. I arrived in America from Ireland in 1869 at the age of 15. I was a very tall, big boned girl, sturdy of build, strong, and very healthy. I was never afraid of hard work, as long as it did not pertain to housekeeping, something I could not abide. Though I never received formal training, I excelled as a cook and found I could easily earn a living at it. Mostly, I cooked at private residences for wealthy families. In the summer of 1906, I cooked for the family of a wealthy New York banker. They rented a large house surrounded by ample grounds in a desirable part of the village of Oyster Bay for the summer. This is where my troubles began. Shortly after my arrival, 6 of the 11 people in that house came down with a fatal fever, including the wife/mother, two daughters, two maids, and a gardener. It started with a headache and then progressed to a loss of energy, upset bowels, a high fever, and ultimately death. With all these deaths, and because this type of unpleasant illness was familiar to me from other places I had worked, I thought it best to resign lest I should fall ill too. So I went to work for a family who lived on Park Avenue in Manhattan. In March of 1907 a Doctor came to see me. One of the maids showed him in and he confronted me in the kitchen. He said he was investigating the illnesses in the banker's house and that I was spreading the disease through my cooking. May the devil swallow him sideways! Having a strange man accuse you of spreading disease and killing people and then ask you to produce your blood and excrement for testing would make just about anybody angry. But I wasn't just anybody. I became so blind with rage that I picked up a large carving fork and advanced toward him. That yellow coward ran from the house, with me chasing him, but he managed to jump a fence and escaped. I believed I would never see the doctor anymore, but that fool came to see me again. This time, he brought another doctor with him. Together, they tried to convince me that I carried typhoid and again asked for a sample of my blood, urine, and feces. They also said that because of my unsanitary habits, I was spreading the disease wherever I went. "What unsanitary habits?" I tipped my head at the spotless kitchen around me, my fists clenched beneath my apron. Then they really insulted me. May the convulsion strike them both! They told me that they sent an assistant to check my rooms at the boarding house where I lived and that it was a pigsty; unsanitary beyond words and covered with dog feces and urine stains. The doctors told me that his assistant said that he would not be surprised if typhoid bacteria were propagating in my filth. How dare they violate my privacy without my permission or knowledge! I refused to comply with their wishes and refused to listen to them any further. So insulted and angered was I that I screamed at the top of my lungs, ordering them to leave while shouting expletives at them as they made a hurried departure. I was not a carrier of typhoid for I had never been ill a day in my life. So I continued to cook for the same Park Avenue family. But those wicked doctors would not let the matter rest. They returned on March 19, 1907. I answered the door with a long kitchen fork in my hand like a rapier. It was the doctor accompanied with a female physican. As I lunged at the woman with the fork, she stepped back, recoiled on the policeman and so confused matters that, by the time they got through the door I had disappeared. 'Disappear' is too matter-of-fact a word; I was proud to say that I completely vanished. Or so I thought. They searched the house. Eventually, they must have spotted my footprints leading from the house to a chair I had placed next to a fence to go over to the neighbor's property. They spent five hours searching both properties, until they found "a tiny scrap of blue calico caught in the door of the areaway closet under the high outside stairway leading to the front door. I emerged from the closet fighting and swearing, both of which I could do with sage brawn. They tried to talk to me sensibly and asked me to let them have the specimens, but it was of no use. The law was wantonly persecuting me and I had done nothing wrong. I never had typhoid fever; I was maniacal in my insistence. I bit two of the officers before they managed to handcuff me and drag me to a waiting ambulance. They took me to a detention center at the Willard Parker Hospital located at the foot of 16th Street on the East River. One of the doctors in the ambulance had to sit on me all the way to the hospital because I continued to strike out in my blind rage. Once there, they forced those humiliating tests upon me and then declared me positive for typhoid. What a bunch of malarkey! May the snail devour their corpses. Afterwards, they moved me to North Brother Island, located in the East River between Riker's Island and the rocky shores of the south Bronx where they put people with tuberculosis or other infections and they didn't know what to do with them. They put me in a small bungalow on the grounds of the hospital where I cooked for myself and had lots of privacy. Still, they brought me here by force and against my will and held without a trial. I had broken no laws. So how could the government lock me up in isolation indefinitely? That's not an easy question to answer. The health officials based their power on sections 1169 and 1170 of the Greater New York Charter: 'The board of health shall use all reasonable means for ascertaining the existence and cause of disease or peril to life or health, and for averting the same, throughout the city." [Section 1169] and said board may remove or cause to be removed to [a] proper place to be by it designated, any person sick with any contagious, pestilential or infectious disease; shall have exclusive charge and control of the hospitals for the treatment of such cases." The world dubbed me "Typhoid Mary". For 3 years I lived like a prisoner on that island. I battled nervousness, depression, and grief. My eyes twitched all the time. My left eyelid became paralyzed shut. Some believed my imprisonment defied the law. Others, especially those in the medical profession, supported my confinement. In 1909, I sued the city of New York demanding my immediate release because of the violation of my constitutional rights. The New York City Health Department argued that I carried the typhoid and posed a danger to the public. One doctor even called me the most dangerous person in New York! Imagine that! I adamantly proclaimed my innocence. How could I carry the typhoid when I had worked in many places where there had been no typhoid? Even at North Brother Island, I cooked for the doctors and nurses there and they didn't get sick. I even argued that I played with the sick children in the wards there with no adverse effects. Why should I be banished like a leper and compelled to live in solitary confinement with only a dog for a companion? My lawyer argued that during my confinement, health officials analyzed my stool samples every week. 120 of 163 samples tested positive. For nearly a year preceding the trial, I sent samples of my stool to a private lab. All my samples tested negative for typhoid. To contend that I am a perpetual menace in the spread of typhoid germs is untrue. My own doctors admit I have no typhoid. I am innocent, yet they treat me like an outcast -- a criminal. How unjust, outrageous, uncivilized. The health officials argued that not all people suffer a strong bout of typhoid fever; some people experience a weak case with flu-like symptoms. Thus, I could have had typhoid fever but never known it. People infected by the typhoid bacillus could pass the disease from their infected stool onto food via unwashed hands. For this reason, infected persons who were cooks (like me) or food handlers had the most likelihood of spreading the disease. I lost. The courts determined they had a duty to protect the community against the disease and ordered me to back to that island. The decision devastated me. The court did proclaim, however, that if cured, they would release me. For a time, I accepted the fallow reality of life on North Brother Island, watching from a distance the bright lights of New York beckoning, unattainable. How could I, who had committed no crime, have my freedom snatched away so easily? By 1910, popular opinion swayed and the public wanted to see me freed. The health commission and the courts decided that I had been locked away long enough to learn what to do to prevent the spread of the disease and that as long as I took care, there was little risk of causing harm to others. Even the doctor was aware that to hold me any longer was a violation of the Constitution of the United States. Still, I refused to believe I carried the disease. After all, I had never had typhoid. Finally, public pressure became too much and the Health Department offered me a compromise. If I promised not to prepare food for others and never to work as a cook again, maintain good habits of personal hygiene, and report to the authorities for regular testing, they would allow me to leave my island prison and return to a normal life. Of course, I readily agreed to their stipulations and on February 20, 1910, they released me. I traveled by ferry to the Bronx where I walked off the boat a free woman, or so I thought at first. With no money, no friends, and no hope to ever cook for anyone again, my future looked bleak. In December of 1911, I filed a lawsuit against New York City and its Health Department, demanding $50,000 in damages. The lawsuit failed. For a while, I found work washing clothes, but I hated it. So I quit. I reported to the Health Department a few times and then never came back. By 1915, everyone forgot about "Typhoid Mary" except for a few instances when newspapers reported on the subject of typhoid fever. How I hated that moniker! After all being publicly humiliated, tagged with a horrible nickname, imprisoned, tested, depicted in photos and illustrations, gossiped about, and teased, I now I lived in poverty. I remained illusive and no one found me, but no matter how hard I tried, I could not find work to support myself. Ultimately, I reached a point where I could either starve or rely on the only skill I possessed - cooking. So using the false name of Mrs. Brown, I took a job as a cook at the Sloane Hospital for Women on W. 59th Street. Misfortune soon followed. In February 1915, an epidemic of typhoid erupted there. 25 nurses and attendants in the hospital became violently ill and unable to work. Because Sloane was a maternity hospital, the threat of typhoid fever caused investigators to swoop down upon the facility and begin testing the water supply which they found to be safe. I kept my mouth shut the entire time, saying little, calling as little attention to myself as possible. But when the focus of the investigators turned to the kitchen, I grew fearful, convinced they would discover me. Some people joked about the possibility of "Typhoid Mary" working in the hospital kitchen. Only I knew how close to the truth that was. As hard as I tried, I failed to evade them, so I submitted to the test with the other employees. Right after, I fled to my house in Corona Queens and began packing up my things. Early the next morning, before I left, the police arrived. They knocked on the door for several minutes. I did not answer. They climbed up to the second floor window and entered. Because the home was virtually empty, I thought they would leave, but instead they continued to search the house. I ran from room to room, keeping a step ahead of them. At last they pushed open the bathroom door and there they found me. With little else to do, I admitted to being Mary Mallon. This time, I surrendered without a struggle. They took me back to Manhattan in handcuffs while officials decided what to do next. In the meantime, the extent of the typhoid outbreak became public. One nurse and a 65 year old chambermaid at the hospital died. Everyone believed I intentionally infected innocent people by my callous and reckless behavior. What were they going to do with me this time, I wondered? When the world learned that Typhoid Mary had struck again, an immediate uproar ensued. Once again, doctors explained that I carried typhoid, and that because of my unsanitary habits, I was spreading the disease wherever I went. They also wanted to subject me to further testing. Again, I refused to believe them and I would not submit to an examination. The public feared infectious diseases because no one understood epidemics very well. 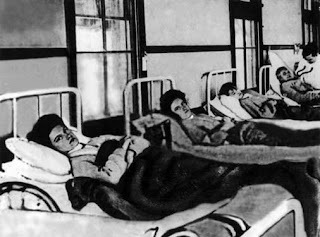 Officials felt a great deal of pressure to do something about "Typhoid Mary." They said that I ignored warnings, refused to cooperate with health authorities, and intentionally spread typhoid among the general population. They dubbed me the most celebrated germ-carrier in the world. Some people wanted me charged with murder for the two deaths at Sloane Hospital while others wanted me locked up for good. The doctor made matters worse. He told the public that I spread typhoid daily with the food I prepared for patients, employees, doctors, and nurses of the hospital, and that out of a total of 281 persons, typhoid attacked 25 of them before they could stop the epidemic. Newspaper editorials lobbied against me. No sympathy remained from when they first incarcerated me in 1909. They said that they had trusted me once before and I deliberately squandered it. This time, I had little recourse through the law. A statute declared that the Health Board required the isolation of all persons and things exposed to such diseases and that the danger to the public health is sufficient ground for the exercise of police power in the restraint of liberty of such persons. By order of the health department, they took me back to North Brother Island and placed me in isolation. I remained defiant and saw myself as a victim of bureaucrats who would stop at nothing to imprison me. As there is a God in heaven, I vowed to seek justice, somehow, sometime. All sympathy by the public had now disappeared after my recapture. This time, I knew of my healthy carrier status - even if I didn't believe it; thus I willingly and knowingly caused pain and death to my victims, and because I used a pseudonym, it made even more people feel that I knew I was guilty. I settled into my fate. Though they kept me isolated, I eventually came into contact daily with nurses and doctors from Riverside Hospital. After a few years, they let me work as a lab assistant at the hospital, but they monitored me constantly. I knew virtually nothing about lab work or the health profession, so I prepared paperwork for the physicians and performed office maintenance. My legal status remained unclear. Though I tried to bring my case into a court of law, it never transpired. A few more years of this kind of life and I feared I would become insane. I had committed no crime, but was doomed to be a prisoner for life! I lived there for the next 23 years. I worked in the hospital as a domestic worker and toward the end of my life, I worked in a bacteriology lab on the grounds, washing bottles. I also had a cottage industry making and selling goods to hospital employees - baking cakes. To my detriment, I never understood typhoid fever. I never believed I carried the disease because I never became ill with it. I could not accept the fact that some people could contract a mild case of typhoid, which resembled the flu, yet continued to spread the disease even after a complete recovery. The history books attributed at least three deaths and possibly hundreds of cases of typhoid to me. Some even had the gall to blame the start of the famous Ithaca epidemic of 1903 on me though they could never prove it. In December 1932, I suffered a severe stroke, which left me partially paralyzed. When they found me, I was lying on the floor of my cluttered, grimy cottage. I recovered enough to continue to work in Riverside Hospital for the next six years. I seldom had visitors, and those that came were careful not to stay past dinnertime. My personal hygiene never improved and my slovenly appearance shocked many. My hair was always unkempt, pulled back in a tight knot, and I always wore a filthy lab coat. I did not harm as many people as Tony Labella did, however. I only caused 47 illnesses and 3 deaths. Labella caused 122 illnesses and 5 deaths. They isolated him for 2 weeks and then released him. Health officials also banned Alphonse Cotils, a restaurant and bakery owner, not to prepare food for other people. When they found him back at work, they agreed to let him go free if he promised to conduct his business over the phone. 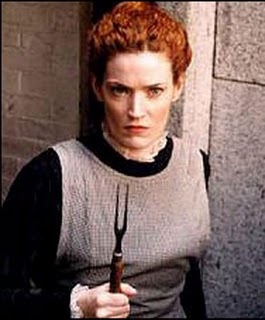 So why does everyone remember me as "Typhoid Mary"? Why did they isolate only me for life? Some believe that my personal identity contributed to the extreme treatment I received from health officials - namely, prejudice for being Irish and a woman, but also for being a domestic servant, not having a family, not being considered a "bread earner," having a temper, and not believing in my carrier status. During my life, I suffered an extreme punishment for something in which I had no control and, for whatever reason, I have gone down in history as the evasive and malicious "Typhoid Mary." In 1938, I died as result of the effects of the earlier stroke. Only 9 people attended my funeral mass in St. Luke's Church in the Bronx. They buried me at St. Raymond's Cemetery. 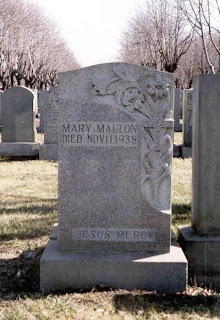 My tombstone reads Mary Mallon Died Nov 11 1938 and, on the bottom of the stone, the words Jesus Mercy appear. But I will always be known as "Typhoid Mary". Very interesting! I had no knowledge of any of this. Thank you! I've always wondered about Typhoid Mary.I'm glad you posted this. 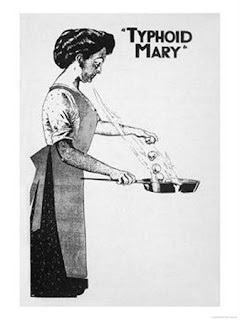 I'm in the middle of reading Fever, and googled Mary Mallon. I'm curious where you got the picture of someone posing as her! Was there a movie about it? Cause I would love to watch that. Thanks for writing this up! Yes, there was a movie made of her life. I think you might be able to find it on YouTube, and if not the entire movie, at least a trailer or something. Typhoid Mary was a very interesting person and I enjoyed researching her story.